The last three years have been dismal for fundamental long/short managers, and stock picking at large. However, at Sentieo, our analysis shows that we are currently in the best environment since before the 2008 crash for picking stocks. Now, that isn’t to say that this is the best time to buy stocks, nor is it a prediction of fund performance. But, according to an analysis of one metric, cross-correlation, the current market should provide an unusually ripe environment for stock picking. First, a bit about what we mean by cross-correlation: The pairwise correlation between two stocks is a value between -1 and 1, that indicates how likely the two securities are to move in the same direction. Over a given time period, two stocks that perform identically will have a value of 1, two stocks have no correlation at all will have a value of 0, and two stocks that are perfectly inversely related will have a value of -1. We ran the pairwise correlations between every stock in the S&P 500 and every other stock in the index (249,500 computations!) from the 2007-8 financial crisis until now. Averaging all of the correlations provides an indicator of how much stocks move in tandem with each other. If the cross-correlation is 1, there would be no opportunities for stock picking since all stocks would move in tandem with each other. The higher the value of the index, the more difficult it is to make money by selecting individual securities at that point in time. The graph below shows the cross-correlation for the entire S&P 500 over the past decade. There are a few important takeaways from this chart. First, it is clear that the cross correlations of the S&P 500 are at decade lows. Second, we see a preponderance of large spikes in the data. As you can see, the spikes correspond with market shocks, the major macro events of the last decade. The jump in cross-correlation following a market shock is to be expected. When this sort of event happens, the entire market tends to turn in one direction as it collectively decides to buy or sell. The most recent inflection point, however, the 2016 election of Donald Trump in the United States, behaves differently. The 2016 US Presidential election has driven correlations to new lows. Furthermore, correlations in the market actually began dropping prior to the November 8th election day, around the time when then-FBI Director James Comey sent a letter to Congress on October 28th. As opposed to the market shocks where the market all reacts in the same direction, it seems the collective market doesn’t know how to react to Donald Trump with any certainty. In other words, as of today, Donald Trump is an inherently uncertain entity that is creating opportunities for security selection. As shown in the chart below, hedge fund monthly returns for long/short equity managers tend to react inversely to cross-correlation, as we would expect. This provides further validation to the idea that cross-correlation is a solid predictor of the overall environment for stock picking. We can further apply cross-correlation to show the volatility of selected sub-sectors of the S&P 500. Doing so, we can demonstrate which specific sectors may have benefitted the most from the US election, again, purely from a stock-picking perspective. Sentieo is pleased to officially announce the introduction of its cloud-based integrated Research Management System (“RMS). The new RMS provides deep analytics to help investment professionals identify and analyze behavior and processes that drive their performance and decisions. How many times did an analyst increase her price target after reading an earnings transcript she annotated as “positive” and did such changes drive positive or negative performance? Sentieo’s RMS allows users to input different variables used in the decision-making process and to track each update. With a robust set of collaboration tools, Sentieo’s RMS allows teams to work together in the same set of shared documents by jointly highlighting, commenting, and annotating. Teams can further synch across devices, forward emails, clip articles, and automatically integrate notes from Evernote and OneNote in real-time. Furthermore, the platform allows teams to analyze their entire decision-making process tracking relationships between various actions like increasing a price target after conversations with management. Sentieo RMS is the first of its kind to be integrated into a robust financial research platform, rather than a point solution. The Sentieo platform includes industry-leading financial document search, a powerful financial data terminal, a data visualization suite for alternative data, and more. The RMS is seamlessly integrated into the product, avoiding the need for an analyst to leave the platform to take notes, share, and collaborate on research. Optimized for compliance and security, Sentieo’s RMS helps asset managers automate and enforce compliance requirements without putting undue burdens on the analysts’ productivity. Sentieo automatically logs all activities and notes, making compliance a breeze. 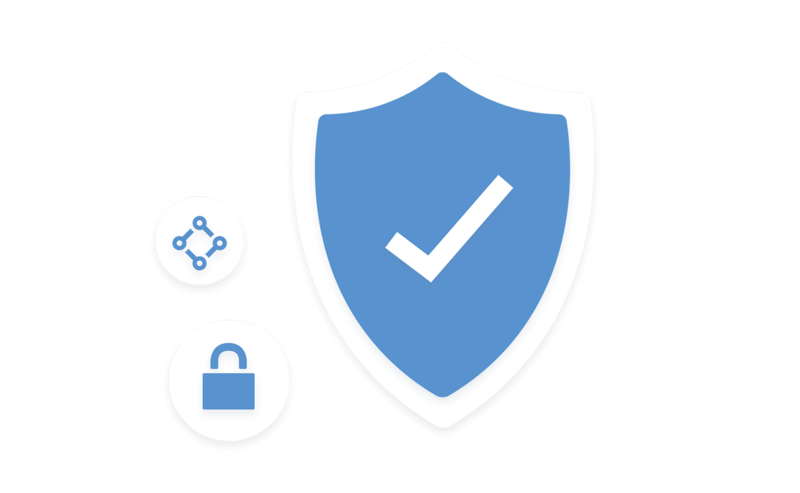 All data is encrypted at rest and in transit, and all notes are versioned, easily searchable and available via an API to be stored in any data vault. Much like their corporate counterparts, consumer-grade apps like Evernote and Microsoft’s OneNote have found their way into the information-intensive investment research process. These applications do provide a basic, albeit limited experience with which to capture, organize, and share information*. On the other hand, legacy RMS vendors provide tools to manage and analyze the research process but their clunky interfaces have missed out on the trend in consumerization of IT. Sentieo RMS combines the best of both worlds: a seamless, easy-to-use, interface with enterprise-grade security and detailed analytics and reporting for compliance. Sentieo helps make investment professionals more efficient. The notebook provides a workspace for organizing and searching all research including notes, highlights, charts and more. Easily gather content that matters and keep it all in the cloud mobile accessible for quick reference. Whether you’re on a desktop or mobile device (iPhone, iPad, Android), you can take notes and access your research regardless of whether you’re at the office or on the road travelling. Our offline sync capabilities even let you take notes without Internet access. Two-way sync with Evernote and OneNote gives you access to all of your Sentieo Notebook content right inside of your favorite note taking apps. Don’t want to disrupt the way you take notes? Create content in Evernote and OneNote and have it sync back to your Sentieo Notebook. Send important emails and attachments directly to your Sentieo Notebook so that you can keep track of all of your notes in a single place. Keep track of interesting articles on the Internet with our web clipper. Save the contents of any webpage for future access in the Sentieo notebook. Keep track of interesting articles on the Internet with our web clipper. Save the contents of any webpage for future access in the Sentieo notebook. Switching back and forth between content sources – SEC filings, broker research, transcripts, company presentations—is a significant waste of time and effort by an investment team member whose skill set is best used to analyze and interpret information, not manage it. Professionals can access all company source documents, investment theses and notes, and financial highlights from a single screen. 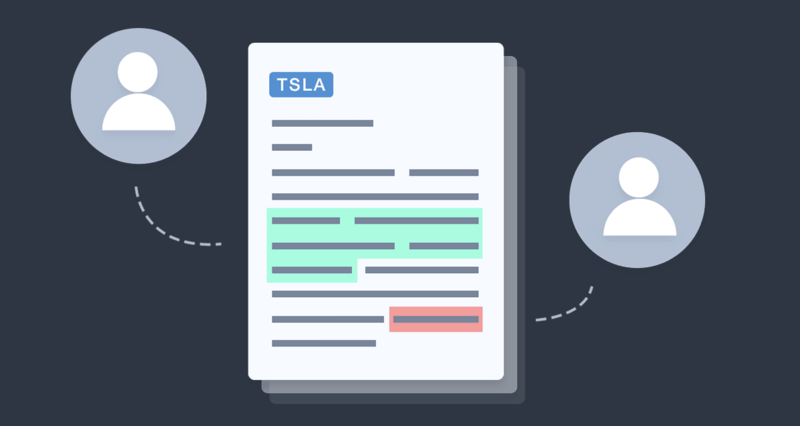 Read the latest company documents and research reports while seamlessly adding highlights and annotations. All notes are automatically tagged with the appropriate ticker, allowing instantaneous recall of key highlights relevant to an investment thesis. In an investment team environment, it’s important to recognize the power of the collective intellectual capability of the team. The market greatly rewards investment teams with a diversity of thought and the courage of their convictions. Ideas, theories, and opinions can flow freely and efficiently across the entire decision-making spectrum, helping uncover ideas while avoiding landmines. Sharing knowledge efficiently both increases the alpha potential and also acts as an intellectual risk management tool. This is why we have designed-in sharing and teamwork all across the platform. Teams can work together on the same set of shared documents (notes, filings, transcripts, research reports, etc.) and collaborate by jointly highlighting, annotating, and commenting directly on any document. Sentieo is where your investment ideas begin to take shape, allowing team members to seamlessly share and exchange ideas with one another. Investment professionals not only need to identify actionable ideas, but they also need to share such ideas with a broader team and convince the broader team of the probability of success. Within the RMS, an investment team (or portfolio manager) can review every document an analyst reviewed and failed to review, every note taken within those documents, every investment thesis written about a company, every meeting attended with that company and all of their peers’ prior comments. Dashboards: The portfolio and ticker dashboards broadcast all recent activity related to companies in the coverage universe. Stay on top of activities such as recent notes, documents, document highlights, company events, comments, and tasks—all on one screen. It also includes a high-level overview of all notes and documents related to the particular ticker, with an activity feed that shows the work that has gone into this ticker all on one screen. Portfolio Summary Table: The Portfolio Summary table enables an understanding of the current state of ideas and investments in a team’s investment universe. Task Manager: Managing deadlines and remembering items on a to-do list can be difficult. With the new Sentieo Task Manager, a user can add tasks to notes and assign them to themselves or a team member, along with due dates. All tasks are automatically aggregated across notes and made available on the ticker dashboard. With an organized way to analyze the research process, portfolio managers, risk managers, and directors can drive transparency across the organization along with oversight into analysts’ recommendations. Management can quickly and easily ‘analyze the analyst,’ validating any investment recommendations being made as well as analyzing each team member’s strength, weaknesses and overall performance in a coherent and logical manner. Our platform has been architected from the ground up to meet an asset manager’s ever increasing security and compliance demands. Sentieo has worked hand in hand with some of the world’s largest hedge funds to deliver fully synced compliance backend systems. As analysts conduct research in Sentieo’s integrated and secure research environment, Sentieo works behind the scenes to provide data management, electronic recordkeeping, and communication control. Given the sensitivity of research information, we offer a high-end encryption protocol, along with options for single-tenant and a virtual private cloud offering. These configurable options allow for the security equivalent of an on-premise solution along with the cost and maintenance benefits of a cloud solution. Last, but not least, management and compliance have access to any and all information across the entire research platform via an administrative login or compliance dashboard. Sentieo automatically logs all activities and notes making compliance a breeze. An organization’s notes, including those synced via our OneNote and Evernote plugins, are versioned, easily searchable and available via an API to be stored in the firm’s data vault. The overall result is a research workflow that makes teams happier, faster, and more efficient. 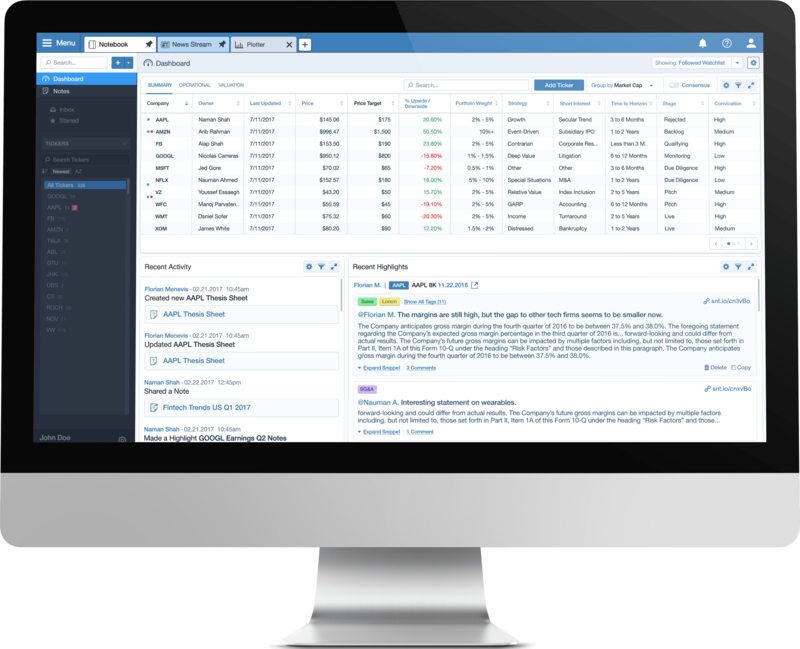 For more information on our new RMS, e-mail us at hello@sentieo.com or request a free trial. *Note: While we believe consumer-grade note-taking apps are not the ideal research management solution, the Sentieo Notebook can integrate with those apps and support compliance recordkeeping needs for users already using them. Your organization’s notes, including those synced via our OneNote and Evernote plugins, are versioned, easily searchable and available via an API to be stored in your data vault.